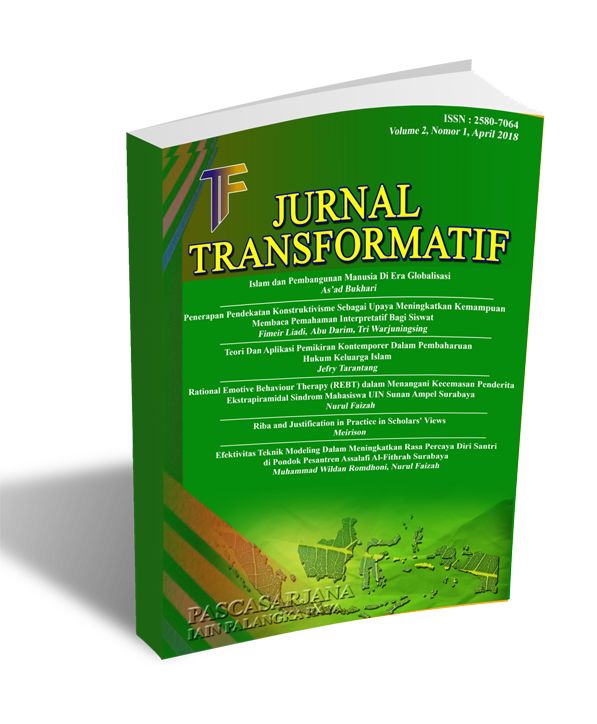 The Journal of Transformatif is a peer-reviewed journal published twice yearly by Postraduate of Palangka Raya State Islamic Institute. As a multi-disciplinary publication dedicated to the scholarly study of all aspects of Islam and of the Islamic world, its particular attention is paid to works dealing with history, geography, political science, economics, anthropology, sociology, law, literature, religion, philosophy, international relations, environmental and developmental issues, as well as ethical questions related to scientific research. The Journal seeks to place Islam and the Islamic tradition as its central focus of academic inquiry and to encourage comprehensive consideration of its many facets; to provide a forum for the study of Islam and Muslim societies in their global context; to encourage interdisciplinary studies of the Islamic world that are crossnational and comparative; to promote the diffusion, exchange and discussion of research findings; and to encourage interaction among academics from various traditions of learning.